An article deals with key figures among Japanese Buddhologists 1880s-1930s: Bunju Nanjio and Unray Wogihara which were participants in the projects of Saint Petersburg school of Buddhist studies. On the base of biobibliographical materials speciments of Japanese Buddhist education analised: it was Chinese Buddhist canon study. Ascertain the fact, that this speciment determined format of Japanese collaboration in the Russian projects. In the article an analytical survey of works of the eminent representative of St. Petersburg school of Buddhist studies Mikhail Izrailevich Tubyansky is made. Basing on the materials and documents kept in the Orientalists Archive of IOM RAS and St. Petersburg department of RAS archive, author demonstrates that the problems elaborated by M.I. Tubyansky were in accordance with the complex program of Buddhist studies worked out by S.F. Oldenburg and Th.I. Stcherbatsky in twentieth years of 20th century. The article deals with analysis and evaluation of the process of development of Russian Indology as a theoretical discipline. Methodological positions and methods of the main contributors to this process (I.P. Minaev, S.F. Oldenburg, F.I. Stcherbatsky, O.O. Rosenberg) are interpreted. Sanskrit Tripitaka, a corpus of Buddhist canonical texts in Sanskrit, unlike fully extant Pāli Tipitaka, is known in original only fragmentarily, in manuscripts revealed in Eastern Turkestan oases and in North Western India. Paleographical studies (1920-2000) demonstrate that dogmatic parts of Sanskrit and Pāli canons - Sūtra (the collection of sermons) and Vinaya (religious disciplinary code) - were formed synchronically in the traditions of different schools of early Buddhism. Expounding the results of her own investigations of a Buddhist manuscript found in 1966 near Bairam Ali (oasis of Merv), the author shows that the core of Sarvāstivāda Vinaya consisted of three texts - «Prātimokṣa-sūtra», «Vinayavibhaṅga» and «Vinayavastu». The paper deals with the ontolinguistic constructions of the Kashmir Shaiva tradition. Its pivotal model is а so called ‘phonematic emanation’ of the indivisible universal consciousness (saüvid) that results in the emergence of the multiplicity of things. The paramount importance of this model (presented in the texts of Mālinīvijayottaratantra, Parātrīśikāvivaraṇa, Tantrāloka etc.) is determined by the necessity to overcome the logical paradox of the co-existence of mutually opposed principles of oneness and the multitude of phenomenological existence. This collision is set off in the tradition by the committing of the ontological status to such reality as Speech (vāc), for the very core of this two-sided entity is the superimposition of the two principles - unity and diversity, presented in the unity of meaning and multiplicity of means that manifest it (words, phonemes). Sanskrit phonemes (varõa) that function as elementary entities in the system (constructing the ‘linguistic gestalt’ of this world) could be compared with the atomistic approaches of other Indian schools of thought (Vaiśeṣika etc.). Some practical aspects of the Tantra practice, such as Mātṛkānyāsa and Mālinīnyāsa and their symbolism are also highlighted in the paper. This article is concentrated on the relations of Muso Soseki (1275-1351), one of the most prominent Zen priests of Muromachi period (1336-1477), with Ashikaga Takauji (1305-1358), the first Shogun of Ashikaga clan, Shoguns’ brother Ashikaga Tadayoshi (1306-1352) and the Emperor Go-Daigo (1288-1339). It is the attempt to analyze the regards of Muso Soseki on Takauji and Go-Daigo, placed in such source as “Baishoron” (“The tractate on Plum and Pine”) where we can see how confucianised the political thought of Zen Buddhists was. The fragment of “Baishoron” is compared with the fragment of “Muso Kokushi goroku” (“The Analects of Muso Kokushi”) where he reflects about the origins of enmity between Takauji and Go-Daigo. The fact that Zen has spread all over Japan because of the Shogunate’s protection is rather well-known but the translated fragment is very illustrious example of it. The theme of the article are the views of Mahāyāna Buddhist school of Vijñānavāda on the problem of origination of the concept of “Self” as a form of false self-consciousness in individual mind, presupposing the existence of Ātman (a substantial soul) and Ātmin (its predicates). The theoretical basis of the conception is the Vijñānavāda doctrine of Ālaya-vijñāna (receptacle consciousness) - a fundamental level of mind constituting the cognitive context of knowledge. In the philosophical discourse of Vijñānavāda the origination of the concept of “Self” was interpreted as an illusion of unenlightened mind, falsely identifying the functioning of receptacle consciousness with manifestation of âtman. On the basis of the text “Da Tang Kai-yuan li” (mid-8th century), that has not been studied in Russian or Western Sinology, the general outline of the imperial rites that existed in the period of the Tang dynasty is presented; the structure of the traditional descriptions of ritual practices, the spatial and temporal aspects of their implementation are analyzed. The article contains the brief history of discovering and investigating of Buddhist manuscripts from Dunhuang and particularly - Vajracchedikā Prajñāpāramita-sūtra (“The Sūtra about Transcendent Wisdom cutting [the darkness of ignorance] like the Diamond [Sword]”; the most known in its short title - “Diamond Sūtra”) - the one of the most popular Prajñāpāramita texts. Th author gives the brief description of Vajracchedikā´s manuscripts from Dunhuang collection preserved at the Institute of Oriental Manuscripts of RAS (St. Petersburg, Russia). The article deals with the sociological study of religious non-governmental organizations of the Russian Federation and the Republic of Korea. The author investigates how ideological innovation processes in politics contribute to the emergence of new forms of social activities within traditional religions of the RF and the ROK. The attention is focused on a comparative research of the Buddhist organizations’ institutional activity in the RF and the ROK. The present paper focuses on recreating the sacred Buddhist landscape in Buryatia, where Tibetan Buddhism has been spread since the early 18th century. The sacred Buddhist landscape is regarded here as a system of natural and artificial objects that serve as physical supports for spiritual practice and, due to their special function of keeping alive historical and confessional memories of the people, are conducive to preservation of its ethnical identity. It is noted that the semiotic function of the Buddhist sacred landscape turns landscape into text. At the same time Buddhist historical and hagiographical texts are full of place names that often offer clues to the text’s meaning and allow its more accurate interpretation. Over the last 20 years the process of recreating the sacred Buddhist landscape in Buryatia has attained certain specific features. Along with the revival of the old objects of worship, such as monasteries, stupas, caves, springs and groves, new objects of worship appear. Most of them memorialize the foremost personalities in the history of Buddhism in Buryatia, among them Pandita Khambo lamas (heads of the Buryat Buddhist Sangha), lama Agvan Dorzhiev, Bidiya Dandaron, and others. The effort to recreate the sacred Buddhist landscape undertaken by the Buryat Buddhist clergy and believers makes an important part of the Buddhist renaissance in Russia. It also plays a great role in developing the region, both culturally and economically. This paper is focused on the problem of using Buddhist symbols in the process of constructing new nations. The comparison of three Mongolian peoples’ capitals shows that Buddhist symbols are more widely used in the modern architecture and monuments in Kalmykia than in Buryatia or Mongolia. The reason is the exclusive history of the Kalmyks who live in the farthest part of the Mongolian world. The article elaborates O. Rosenberg’s conception of typological similarity between the Buddhist term “ālaya-vijñāna” and absolute “Self” in Fichte’s philosophical system. The topic of the article is the process of reception of Buddhist ideology in Western mass culture represented with novels “The Lord of Light” of R. Zeliazny, F. Herbert’s “Dune” and “The left hand of darkness” of U. K. le Guin. This reception is a response to the problems determined by the logic of evolution of Western culture, and among all notions of Buddhism only those are received that helps solve these problems so the reception is selective and the original Buddhist notions, being received, are profoundly reconsidered to become a natural component of Western culture. Key words: East and West, intercultural dialogue, Buddhism, Buddhist ideas in western science fiction. In the article the process of development of Christianity in the Far Eastern cultural region is analyzed. Relying on the scriptural and archeological sources, the author distinguishes four stages of the process, marking them as Sogdian, Uighur, Mongolian and Russian ones. Views of E.E. Ukhtomsky (1861-1921) on the role of Russia in preventing conflicts between the Eastern and Western civilizations are the main topic of the article. Attention of the authors is focused on Ukhtomsky’s work “On the events in China. Relation of the West to the East and Russia”, published in 1900, the subject of which is typological features of Russia as the Eurasian power whose mission is to guarantee peace in Asia and Pacific region and make the decisive contribution to the development of dialogue between the Eastern and Western cultures. The article is dedicated to phenomenon of the use of the Sanskrit inscriptions by the lañja script in the architectural decoration of the Buddhist temples in the territory of Central Asia. 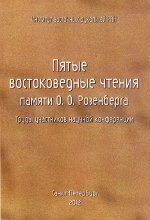 The author states his own analytical observations in connection with the Sanskrit inscription by the lañja script, which is placed on the relief in the wooden carved shutter main temple of the Buddhist abbey in village Cugol (Zabaykaliskiy county of Russian Federation). The relief was executed more than one hundred years ago. It is shown that in this relief, whose composition contains the inscription lakṣmī and two Chinese symbols of happiness and long life, synthesized Indian and Chinese symbolism of the good wishes, and this symbolism has the Buddhist cosmological connotation. The author notes three mistakes, discovered by him in the inscription, and speculates on the reason for the appearance of these mistakes which are often observed in the Sanskrit inscriptions used in architectural decoration of the Buddhist temples in Central Asia. The author presents his reconstruction of the Sanskrit inscription by the lañja script from the Cugol datsan in which the three mistakes are corrected. This article of the eminent investigator of Central Asia Mikhail Mikhaylovich Berezovsky (1848-1912), which was not published till now, summarizes his experience of archeological expeditions in the oases of Eastern (Chinese) Turkestan - Turfan and Karashar, where he studied relics of the first millennium Buddhist civilization during the period of 1902-1908. The manuscript of the article (autograph by M.M. Berezovsky) is kept in the Archive of Orientalists of the Institute of Oriental manuscripts of the Russian Academy of Sciences. There are no marks in the manuscript indicating the date of it and it can be reasonably concluded that it never was finished. The article is of much interest for history of Oriental studies in several aspects. Firstly, it shows safely level for antiquities in Turfan and Karashar till the beginning of the expeditions of M.M. Berezovsky in this region and problems met by him owing to geographical features of the territory. Secondly, in the article principles of archaeological study in Eastern Turkestan are formulated. And thirdly, it characterizes activity of M.M. Berezovsky as a geographer and archaeologist. Rennyo (1415-1499) is a figure of enormous influence. Rennyo transformed a relatively small religious sect into a powerful religious organization. Before him the church, Honganji, was only one among many branches of Shin Buddhism. Rennyo emerges as a religious leader who deeply understood the anxieties of his age and stated a response that met with overwhelming acceptance. His propagation created large communities of Shin followers that came to play a prominent role in popular movement, known as the “Ikko-ikki”. “Rennyo shonin goichidai kikigaki” is a record of what was heard about the whole life of Rennyo shonin. The record is compiled from stories of his life and recollections of various disciples and relatives. Rennyo was idealized, and his image is an inspirational portrait of charismatic religious leader. We can find a wealth of information concerning religious leader himself, the age in which he lived and the history of late medieval Japan. Memoirs are an essential source for any study of Rennyo’s life and thought and also the Japanese history of XV century. “Kikigaki” contains 314 items (Nishi Honganji version) or 316 items (Higashi Honganji version) or 249 items. The text for this translation of Memoirs is “Rennyo shonin goichidai kikigaki” (314 articles), published in highly appreciated series of written sources of Japanese thought “Nihon shiso taikei”, vol. 17.